Great Witchingham is a small parish to the northwest of Norwich. Great Witchingham itself is now little more than a cluster of buildings in the centre of the parish. The larger village of Lenwade is in the south of the parish, on the banks of the River Wensum. Lenwade comes from the Old English meaning ‘ford crossed by a lane’. The parish also includes the tiny hamlets of Blackwater and Foxford. Various prehistoric flint implements (NHER 37286) have been found scattered through the parish, including Palaeolithic flint flakes (NHER 3025, 3027 and 7703), Palaeolithic flint hand axes (NHER 3026, 3027 and 3028) and a Mesolithic flint flake (NHER 3030). A Neolithic henge (NHER 1018) is visible as a cropmark on aerial photographs of the hamlet of Foxford. The henge is a double ditched enclosure with a number of internal pits, arranged in an irregular circle. A ring ditch, probably the remains of a Bronze Age round barrow, is visible as a cropmark near the henge. Neolithic axeheads (NHER 3031, 3032, 7441, 7444, 11931 and 14957) have been found in the parish, as well as an Early Bronze Age axehead (NHER 37286), a Bronze Age copper alloy chisel (NHER 28968), a spearhead (NHER 39541), an axehead (NHER 39544), and casting waste (NHER 39544). A Late Bronze Age hoard (NHER 35269) of socketed axeheads was found by a metal detectorist in 2000. No other evidence of prehistoric settlement has so far been found in the parish, although the presence of a Neolithic henge suggests that this was an area of some importance. An Iron Age scabbard mount (NHER 39542) with a curving spiral design was found by a metal detectorist in 2002. Iron Age coins (NHER 40668), an Iron Age brooch (NHER and fragments of Iron Age pottery (NHER 35269) have also been found. Roman brooches (NHER 39542 and 40667), Roman coins (NHER 30584, 31623, 37286, 39544, 40531, 40664 and 40668), Roman pottery (NHER 29481 and 35269) and part of a Roman bracelet (NHER 40672) have been found scattered throughout the parish. So far a definite centre of Iron Age or Roman settlement has not yet been identified. Witchingham comes from the Old English meaning ‘homestead of the family or followers of a man named Wic’. Early Saxon brooches (NHER 39542, 40664), and a Middle Saxon strap end (NHER 40672) have been found. Late Saxon brooches have also been discovered (NHER 39544 and 40667), including an important example of a Late Saxon disc brooch with a backward-turning animal, and an excellent example of a Middle or Late Saxon disc brooch (NHER 40668). A silver and gold filigree Viking pendant, (NHER 40668) in the shape of Thor’s hammer, was found by a metal detectorist in 2003. Other Late Saxon metal finds (NHER 40667 and 40668) have also been recovered from the parish, which is notable for the number of high quality Late Saxon metal finds. No distinction is made in the Domesday Book between Great and Little Witchingham, but Witchingham is recorded as a fairly substantial and valuable settlement, with a church and an outlier in Weston Longville. During the Late Saxon and medieval period the hamlet of Thurton (NHER 11525), or Middleton-in-Witchingham was situated to the north of the parish, close to Manor Farm. The small settlement is recorded in Domesday Book, and became gradually deserted over the medieval period. A large rectangular cropmark is visible on aerial photographs, and may be a medieval moated site or a building. The earthworks of a medieval moated site (NHER 3156) are close to the site of the deserted settlement. The moat has some stretches of medieval flint retaining walls. A medieval moat (NHER 29481) also survives in Blackwater, with associated rectangular enclosures. During the 12th century a Cluniac monastic cell (NHER 3033) was founded in the parish, close to the hamlet of Blackwater. The cell had been destroyed by the early 15th century, and an excavation in 1935 uncovered the remains of a small building. Medieval floor tiles and fragments of pottery were found during the excavation. 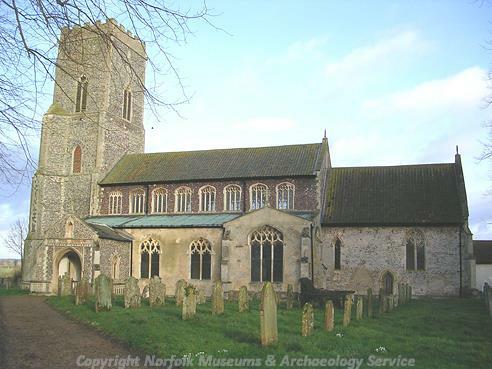 St Mary’s Church (NHER 7474) in Great Witchingham is now almost totally isolated within the parish. The church dates mainly to the 14th century, although it may date back to the Late Saxon period. The church contains a 15th century Seven Sacrament font, which retains much of its original medieval paint. The font is one of the best examples of its kind in the county. A large stone medieval font (NHER 16567) or cistern was ploughed up to the north of the church in the 18th century. Witchingham Old Hall (NHER 15276) was a 16th or 17th century hall that was remodelled in the 18th century, and demolished in the 19th century. The barn and garden walls that still stand on the site date to the 17th or 18th centuries. 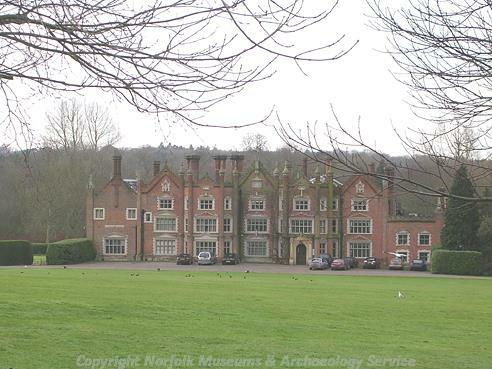 Great Witchingham Hall is a 16th or 17th century hall, which was substantially altered in the 19th century. The Hall contains a good example of a carved 17th century fireplace. A 19th century brick icehouse (NHER 7746) stands in the grounds of the Hall. A small early 19th century lodge (NHER 41183) stood near the entrance to the Hall. The lodge was demolished in the 1980s. The lodge stood close to the walled gardens (NHER 42851) of the Hall, which also dated to the early 19th century. The Hall is now the headquarters of Bernard Matthews. Blackwater Farm (NHER 41071) is a 17th century farmhouse, and a nearby L-shaped pond could be the remains of a medieval moat. Manor House Farm (NHER 21061) is a 17th century house and walled garden, with a good example of a 17th century plaster ceiling. Blackwater Cottage (NHER 24372) is a late 17th century cottage with a thatched roof. Parts of the cottage may date back to the 16th century. Church Cottages (NHER 41070) and Church Farm (NHER 41182) also date from the 17th century. River Farm (NHER 21667) is an early 18th century house, probably built around the core of an earlier house. 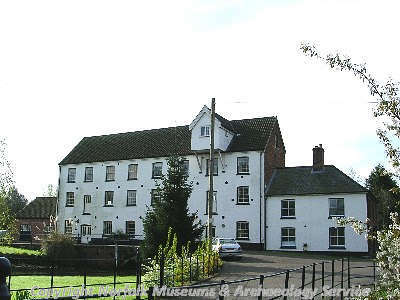 Great Witchingham House (NHER 41069) is a former rectory dating to the late 18th or early 19th century. Lenwade Bridge (NHER 13765) was originally built in 1741, on the site of an earlier bridge. In the 1920s another bridge was built alongside the 18th century bridge, and the two stood next to each other until 1954. During World War Two a tank trap was constructed on the bridge. A new bridge was built in 1992. The Bridge Inn (NHER 18413) may originally have been a 16th century timber framed building, which was substantially rebuilt and extended in the 18th century. The White House (NHER 18412) dates from the late 17th or early 18th century, and was expanded to form a double pile house in the late 18th century. The Gothic House (NHER 18411) is an 18th century cottage, with arched windows and other Gothick architectural details. 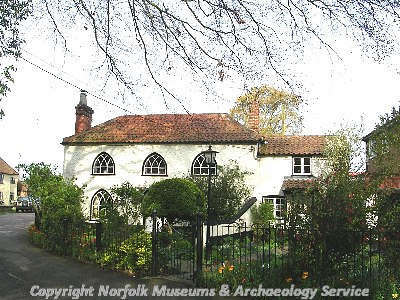 Rose Cottage (NHER 3060) was formerly used as a workhouse in the post medieval period. St Faith’s Church (NHER 12699) is a red brick 19th century building. Lenwade Watermill (NHER 7747) dates from the late 18th or early 19th century, and was rebuilt after a fire in the late 19th century. The mill was one of the first roller mills in the county. In 1944 a V2 rocket (NHER 31019) landed in the parish, near Eade’s Mill (NHER 3160) and the large crater has since been turned into a pond. A rare example of a World War Two machine gun emplacement (NHER 32487) stood in a garden opposite Lenwade Watermill. English Heritage has identified a Cold War Royal Observer Corps monitoring post (NHER 18080) as a monument of national importance. The post is of a type unique in Norfolk; a brick tower with an Orlit post on top. Sarah Spooner (NLA), 20 January 2006.